The composite fiberglass posts on your new pool fence give you unbreakable strength and so much more. Most mesh pool fences look alike. They have a 1″ diameter pole that supports the mesh, they latch together… pretty basic so they are all about the same… Right? WRONG! Most of what you see offered are Chinese imports competing for the lowest price. Even most of the fences still made in the USA do their best to compete with those low Chinese prices. Those price savings must come from somewhere. Since the fence is for your child’s safety, you need to know where. 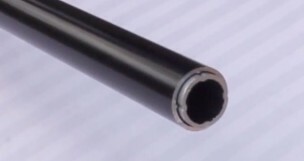 You’ll find they have cut corners where you won’t notice – but actually where it matters most… in the wall thickness of their aluminum support posts. Most use the minimum thickness possible at .049 which is only 1/20 of an inch. They offer an X or Y pattern in the post they will say reinforces it but actually doesn’t help. WHY DOESN’T’ IT HELP? To assemble the fence they must drill a hole at the bottom of the post (the fulcrum point) to attach the mesh. That hole becomes the weak point and is where they snap time and time again. And the stainless steel pin offered on most DIY fences? 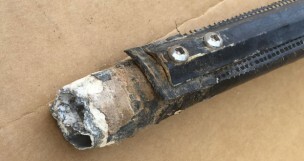 Again, little help because the pin only extends about 2″ up into the thin wall tube. Watch the video above of children playing around the fence and the video to the right of adults comparing side by side to see for yourself. You’ll see how amazingly different Protect-A-Child Pool Fences are. After all, it’s your child’s safety we’re talking about. When you invest in a new pool fence, you want it to stay straight and attractive, and provide a safety barrier you can trust. We reinforced our already-strong composite fiberglass posts with a solid fiberglass rod core, giving them superior strength over other types of posts. You can count on your Protect-A-Child pool fence posts to never become bent or crooked, meaning they will alway look great and be virtually maintenance-free. In fact, they are the only posts in the industry to include a lifetime warranty against breakage or becoming crooked. 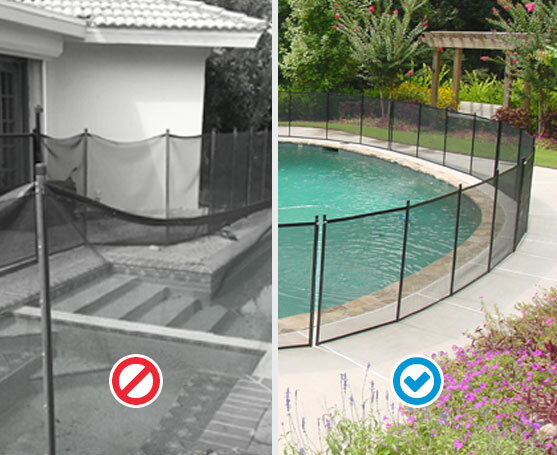 If you’re like many customers, you may have thought that all mesh pool fences are alike. Black mesh, black posts, so what’s the difference? What you may not have realized is that many aluminum-post fences are made thinner and thinner to shave costs in an attempt to compete with the increasing number of import fences. The result is extremely weak fences. We set out to educate the public about this matter by testing these weak posts against and our composite fiberglass fence posts. 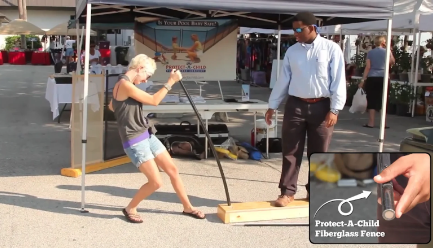 The testing shows the amazing superiority of our unbreakable fiberglass posts, in both strength and resiliency. We hope this helps you to understand the advantages of fiberglass so you can make your decision based upon more than just cost savings. Whether your child is bouncing off the fence or a friend leans against it at a barbecue, you can be sure it will resist the force and continue to stand straight, tall and taut. This is a major advantage over aluminum pool fencing, which becomes permanently bent with just a minor strain. Once an aluminum post is bent, it remains crooked and may even break, leaving you with an unattractive and—worse—an unsafe fence. Our composite fiberglass posts have 27 years of proven success, giving you the confidence that they will keep your new mesh fence secure and looking great for years to come. Just as our fiberglass posts were created to give your pool fence long-lasting support, they were also designed with long-lasting color. 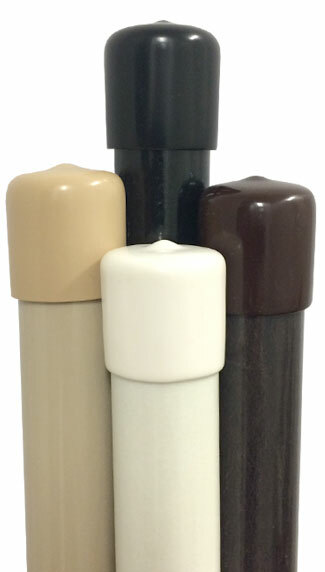 The pigment of Protect-A-Child’s fiberglass posts is built in with colored resins that permeate the entire post, compared to raw aluminum posts, which are typically coated or painted on to provide color. This is why the color of many aluminum posts can scratch easily or flake off. 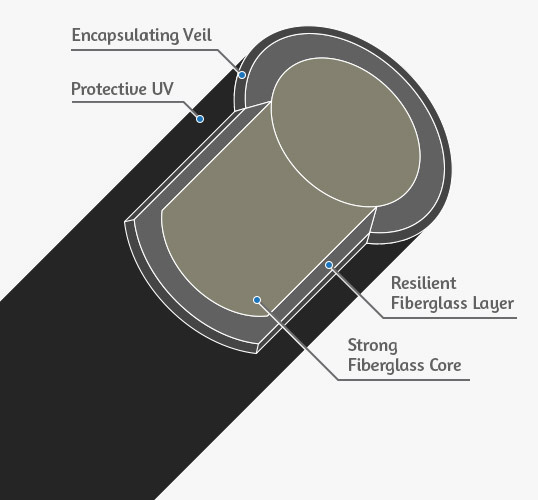 Our fiberglass posts include UV-protective resins and innovative encapsulating veils that prevent UV deterioration. You also can choose from a variety of color options for your fiberglass posts—giving you a long-lasting, attractive fence that complements your fun backyard pool area. 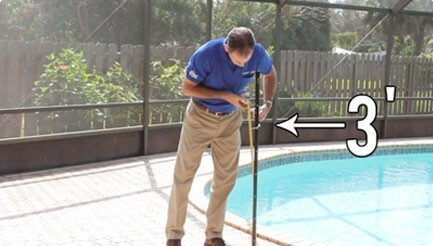 Be sure your pool fence exceeds local codes. Our fencing was tested by an independent engineering company against all known swimming pool barrier codes. 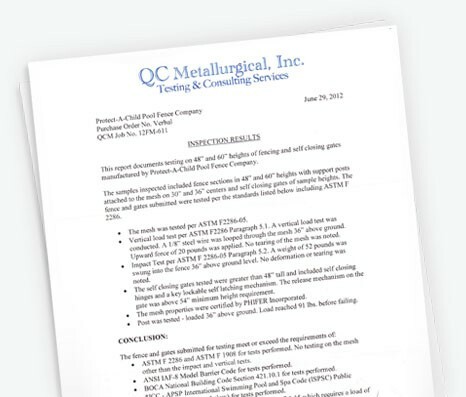 The results prove that Protect-A-Child meets or exceeds ASTM, BOCA, ANSI, and ICC- APSP standards. Whether you need your fence to be removable or permanent, we offer multiple installation options to satisfy all code requirements. Our fiberglass posts do not require grounding near the pool, as is the case with aluminum post fences. Unlike hot metal aluminum posts, your new fiberglass posts stay cool to the touch in summer heat. Our pool fence's fiberglass posts are not susceptible to corrosion or deterioration like aluminum posts.